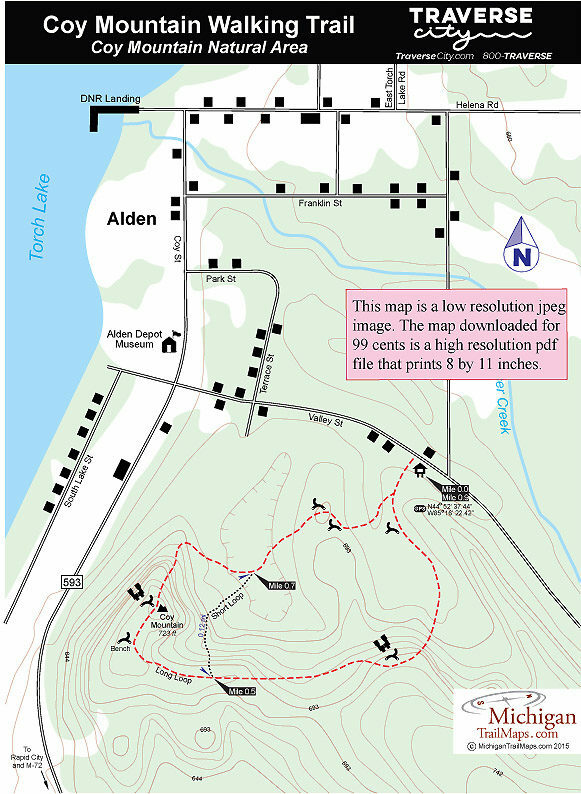 Tucked away on the east side of Alden, oblivious to most visitors who are mesmerized by Torch Lake to the west of town, is a small mountain with a short but interesting trail system. 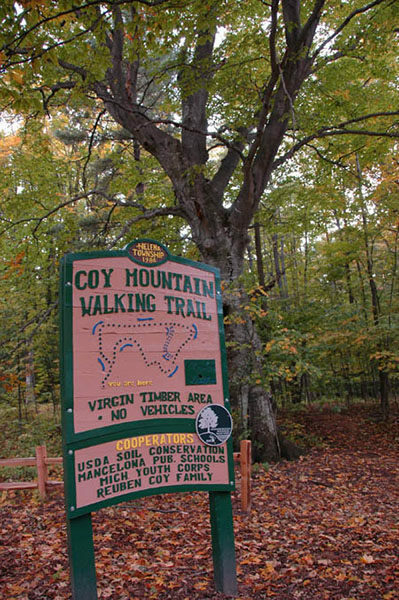 Coy Mountain Natural Area dates back to 1885 when Reuben Coy decided to preserve a ridge forested in virgin hardwoods that towered behind his gristmill. 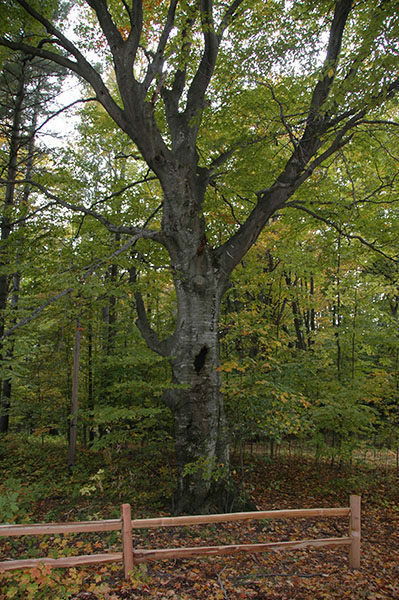 It was the last remnant of the giant maples and beeches in a region that had been heavily clear cut by loggers.The 11-acre tract remained in the Coy family until 1958 when Reubens daughter-in-law deeded the property to a group of trustees with the intentions of preserving Coy Mountain for the use and benefit of the Villagers of Alden. Tucked away on the east side of Alden, oblivious to most visitors who are mesmerized by Torch Lake to the west of town, is a small “mountain” with a short but interesting trail system. 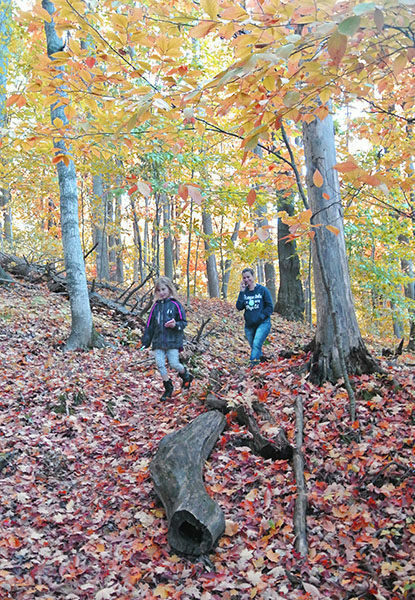 Coy Mountain Natural Area dates back to 1885 when Reuben Coy decided to preserve a ridge forested in virgin hardwoods that towered behind his gristmill. It was the last remnant of the giant maples and beeches in a region that had been heavily clear cut by loggers. The 11-acre tract remained in the Coy family until 1958 when Reuben’s daughter-in-law deeded the property to a group of trustees with the intentions of preserving Coy Mountain “for the use and benefit of the Villagers of Alden and the surrounding communities”. The trustees in turn presented the land to Helena Township in 1985 and a year later the natural area was dedicated. Right from the start this small preserve was a community effort. Additional land donations from local residents enlarged the park to it’s current 17 acres. The construction of the trail system was an Eagle Scout project with Alden Volunteers assisting to expand and complete the project and the Alden Lumber Company donating the materials. Other groups, from Michigan Youth Corps to Mancelona Public Schools, have put in their time to help preserve this mountain in the middle of this small Antrim County town. Today Coy Mountain Natural Area is a leg-stretcher. A fine place to get out of the car and enjoy the forest and its wildflowers in the spring and magnificent colors in October. The trail system totals a little more than a mile and includes the 0.9-mile Long Loop and a Short Loop. The Short Loop is indeed slightly shorter and doesn’t have quite the elevation gain but it would be a shame not to follow the Long Loop. For the effort of climbing 170 feet you are rewarded with a view of Torch Lake from the top of Reuben Coy’s mountain. At the trailhead a display sign announces you are entering a “virgin timber area” but sadly the forest’s last virgin trees were stolen in the early 1990s. Still the first tree you see is a giant American beech, a neck bender whose limbs are like arms reaching for the sky. From there the trail heads south as a level path that quickly passes the junction with return trail. Trail signs have you continuing in a clockwise direction and within a quarter mile you begin a steady climb. In less than a quarter mile you reach the first of two lookouts. 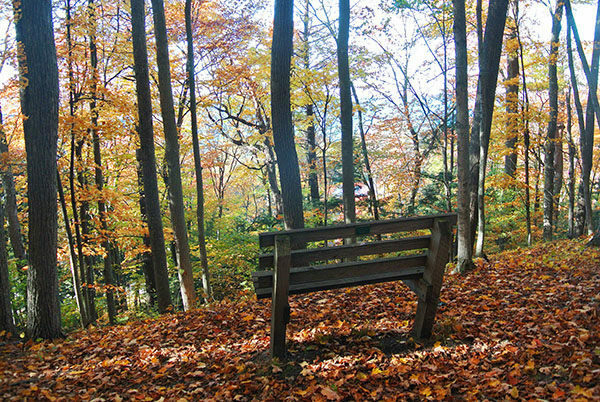 Here you can sit on a bench and gaze into a wooded hollow that makes for beautiful scene in the fall. At Mile 0.5 you pass the posted junction with the Short Loop and then the Long Loop quickly climbs to the top of the ridge where there are two more benches. The second is probably what is considered the “peak” of Coy Mountain and from it you get a glimpse of Torch Lake to the west and can hear the bustle of Alden straight below you. The Long Loop then makes a rapid descent pass more impressive beech and maples before bottoming out at the second posted junction with the Short Loop at Mile 0.7. The remaining quarter mile back to the parking area returns to being a somewhat level walk through the woods that includes still more impressive timber. The only facilities at the trailhead is a small parking area and a display map. There are no entrance or vehicles fees to the park. From County Road 593 (Coy Street) near the Alden Depot Museum and Park turn east on Valley Street. Within two blocks, near the corner of Valley Street and Smalley Street is the Coy Mountain parking area. Call the Helena Township office (231-331-4643) from 9 a.m. to noon Monday through Thursday.